The best species at running away. The Boov will move. And their new home world looks a lot like Earth. Welcome to Happy Humantown. A nice place if you’re into relocation. For some reason the word “forced” was erased before I hit the Tweet button. I meant to say “forced relocation,” i.e., a human reservation. Isn’t it nice to know that it’s not just us humans who hate this potentially catastrophic email option? Antarctica...the only place on Earth with no Boovs. Probably has something to do with their skimpy outfits. Nice mash-up of the words slushy and luscious. “We are definitely not doomed.” Uh, yeah you are. Politicians, who put on a brave face so as to not create a panic among the populace, often say the exact opposite of the truth. I guess exposing kids to this reality right off the bat is a wise move. Boov turns car into a slush-mobile. A thousand bubbles per pint. For some reason this modified vehicle, though radically different in body style and technological capabilities, reminds me of the flying car concept in The Absent Minded Professor (1961). “Every time you lie you turn green.” That’s what happens when you drink too much #BustaLime. A Boov tell. Maybe we can win the planet back with a well played hand of poker. And with all of those appendages, Oh proves to be a natural at cutting a rug. Don’t worry, Oh, we human males can’t figure out the females of our species either. Nine mistakes and you’re out. Oh has made 62 mistakes. He’s the #JarJar of the Boov. This character trait—error-prone—is a bit too telegraphed in the story and is a clear rip off of Star Wars’ JarJar Binks. Oh cancels his evite just in the nick of time. And with the crisis averted, the movie ends right here. Not quite. Though not quite Yoda-esque, the Boov’s assimilation of English has some curious, linguistic aberrations. Bubble car chase is a lot of fun. This sequence is the visual zenith of the movie. It’s a frenetic, fun-filled chase scene that’s right up there with the best efforts of Lucas and Spielberg. The only thing that can halt the Gorg advance is a #BurritoTorpedo. I think I ordered that at Taco Bell once. Didn’t agree with me. “He runs toward the danger?” Oh learned that from a humans person. Must’ve been a soldier or fire fighter. Captain Oh is given the Shusher. The Boov celebrate their new leader. Now shush so I can think! The mother/daughter reunion scene is special. Anyone have a tissue? “You were scared? I almost made a Number Three!” Hilarious! The funniest line in the movie, tentacles down. The real identity of the Gorg is a nice twist. A riff on #StarTrek’s #Balok. From the original Star Trek series’ episode “The Corbomite Maneuver,” for all you diehard Trekkers out there. Yes, I am part of the body. Additionally, the subplot involving the Gorg (similar in sound to Gorn, right?) being the last of its kind is similar to the creatures in “The Man Trap” and “The Devil in the Dark.” Also, the repository of Gorg offspring inside the rock is similar to the chamber of silicon nodules in “The Devil in the Dark.” Queen to queen’s level three? Unless you’re having a bad day. Final analysis: an alien invasion story with some good laughs and a heartwarming finale. Rating: 2 1/2 out of 4 stars. Fairly pedestrian at times but rallies for a resolution that’s straight from the heart. The alien invasion premise has been done ad nauseam in films (Invasion of the Body Snatchers, Alien Nation) and TV (V, Earth: Final Conflict) over the years and has become an unofficial sci-fi sub-genre. Unfortunately, the variation on the theme featured in Home isn’t groundbreaking in either its conception or execution. On the run from the dreaded Gorg, the Boov invade Earth and relocate the entire human population to a carnival style reservation area, and no one protests their captivity since they now have an amusement park existence—go with it, it’s a kid’s movie. 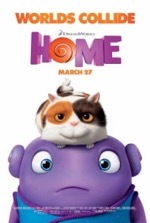 A young girl, Gratuity “Tip” Tucci (Rihanna), hiding out inside Boov inhabited territory encounters Oh (Jim Parsons), a mistake prone purple skinned alien whose bad decisions and clumsy pratfalls drives the plot. Whereas the standard issue story is the film’s greatest detriment, the unlikely friendship that blooms between Oh and Tip is what makes the film fly. Also, the finale, though certainly not original, is a genuine tear-jerker that should leave most adults in the audience feeling satisfied with the end result; kids will probably love this movie no matter what, thanks to its explosion of colors, sleek technology and fast paced plot. That model—entertaining the kids while servicing the adults with meaningful storylines—was pioneered by Disney and perfected by Pixar. Indeed, for the better part of two decades now, Pixar has been the undisputed leader in producing animated films that succeed at captivating the young minds in the audience while simultaneously engaging adult viewers on a deep emotional level (reference WALL-E and Up). Up until the last few years, most animated films were only able to achieve the former, but now the other major animation houses have begun to adopt Pixar’s adult-centric formula…with great success. Home is certainly an exemplar of that strategy, especially during its surprisingly powerful resolution. In some key ways the ending here reminds me of the one in Disney’s Mars Needs Moms (2011), another animated film that stages a tearful reunion between mother and child during the movie’s climactic passage. In the end, Home isn’t Earth-shattering, but it is a heartwarming tale of courage, compassion and companionship. Above all, the film shows us, in stark contrast to Boov mores and mannerisms, what it really means to be human. They say that home is where the heart is. If true, it shouldn’t be too hard to find room in your heart for Home. Marital Law is immediate. War is imminent. “You killed us all.” Bleak nightmare. Tris self-sheers. She wanted to do something different. Her new coif makes her look like the girl in The Fault in Our Stars. Correction: self-shears. Also, Twitter doesn’t have an italics feature, otherwise I would’ve italicized the word “do” to create a pun with the shortened version of hairdo. And now I’ve ruined my magic trick by explaining it. Jeanine inspects the founder’s version of the AllSpark. This rectangular, rune-scrawled object also reminds me of the artifact in The Fifth Element (1997). Peter shouldn’t have insulted Tris’ parents. The easy way...but under protest. It’s not the same as the “easy way” in Back to the Future II (1989), though. Why doesn’t Caleb help out Tris when she’s attached? I only ask this because he just made his first kill. Yes, he’s probably in shock over such an action, but his sister’s life is literally hanging in the balance. Correction: attacked. The new predictive function on iPhones thinks it’s being helpful when presenting words that look similar to one another. In a darkened theater, with a darkened phone screen, it’s easy to select the wrong word. The defense rests. Don’t call Four Tobias. He won’t even let his mother call him that. It’s not wise to call Indiana Jones “Junior” either. Unless you’re a betrothed Minbari. The dystopian landscape is really well done in this film. Fittingly, all Candor clothing is black and white. ‘Cause that’s the way they see the world. Get it? “May the truth set you free.” And destroy your reputation and alienate your friends. I meant to say, “alienate you from your friends.” But I trust the point was made. A very well-acted scene as Tris resists the truth serum with every ounce of her strength so as to not reveal her deep, dark secret. “Thank you for your candor.” Up yours! Jeanine is searching for a “special” Divergent. Gee, I wonder who that could be. 10% Divergent equals a bullet to the head. This story element, which doesn’t appear in the book, is very effective in ratcheting up the tension. Four shooting Eric cheapens his death. I much prefer Tris stabbing Eric in the book. It was too soon to knock off the arrogant henchman. The audience needed to derive a greater feeling of vindication and satisfaction from Eric’s death. As filmed, it’s just a shallow slaying. I could’ve skipped seeing Four’s tattoos again. I know this gratuitous scene was placed here just for the teenybopper fan girls in the audience, but seeing Four’s tattoos once was quite sufficient. Actually, I could’ve skipped such a visual altogether, but that’s just me. “We have plenty of guards.” Now that’s cold. Jeanine shows Peter no respect, just like Peter shows Tris no respect. Bitterly ironic. First sim: Tris must rescue her mother from a burning, flying house. This is a superbly crafted sequence, but it’s overlong and overblown. This is a pretty weak “Ah-ha!” moment. In the book, Tris knows she’s in a sim because Four grabs her on the shoulder where her bullet wound is, something her caring boyfriend would never do. Amazing FX on the building demolitions. If you’re into large-scale destruction. “Are you real?” Better check his tats to make sure it’s really Four. On second thought, let’s not. Tris confronts her dark side. Divergents...the true purpose of the experiment. As the culmination of the five factions, this revelation isn’t that much of a surprise; nor is the fact that they should be looked upon differently since they’re…different. There’s hope beyond the wall. But is there any hope for those inside the wall? Stay tuned. A mass exodus of Divergents. Final analysis: a solid follow-up to the first film, with some significant twists from the book. Actually, the divergences from the book are extensive. Here are just a few: Marcus has a more prominent role in the action, there’s no AllSpark artifact and the loyal Dauntless join with the factionless to march on Erudite as a retaliatory response to the wrong’s committed by Jeanine and her lot in the first film. Rating: 3 out of 4 stars. Some good action scenes and some superb FX. A solid set-up for the finale. As sequels go, Insurgent, based on the teen book series by Veronica Roth and the follow-up to last year’s Divergent, is a solid effort. The middle chapter of any trilogy typically has an identity crisis—it’s either too similar to the initial movie or it strays too far in the wrong direction so as to be virtually unrecognizable when measured against the original concept. 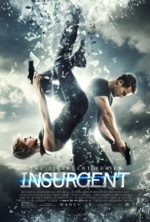 Whereas you’ll probably be lost if you haven’t seen Divergent, Insurgent stands on its own and is a logical extension of the first film rather than a radical departure from it. The vast majority of middle films will either end with a cliffhanger (i.e., Vader’s mind-blowing revelation that he’s Luke’s father in Star Wars: Episode V - The Empire Strikes Back) or the continuation of a journey (i.e., The Lord of the Rings: The Two Towers). With Insurgent, something strange happens for a middle chapter film…it resolves. In fact, it resolves to the degree that the saga can end right here with the characters living reasonably happily ever after. Of course, there are enough plot threads still dangling out there to justify extending the story, but the fact that it could’ve ended right here is a truly bizarre anomaly for a mid-trilogy film. Shifting gears to production, the bombed out environs are exceptionally well staged here; the rough, rubble riddled landscapes perfectly mirror the arduous psychological and spiritual journey the characters embark upon in the film. Indeed, the physical structures are soon transformed into mental ones as we get a glimpse into the architecture of the mind: Tris is subjected to a new battery of sims, just in case we didn’t get our fill of them in the last movie. Aside from the city exteriors, the only other environment worth mentioning is the Amity faction, which perfectly reflects the natural, serene vibe of its inhabitants. Since there are only a few substantive character moments in the movie, the acting won’t stand out as stellar…more like serviceable. The action sequences are mildly entertaining, but are somewhat standard issue for what we’ve come to anticipate from non-bloody, teen-centric confrontations. So, what can we expect from Allegiant, the final film in the series? Those who’ve read the books might feel like they have an inside track to what will happen, but if this movie’s deviations from book to script are any indication, we could be looking at a significantly different cinematic conclusion to what appears in Roth’s novel. To their credit, these adapted screenplays haven’t been slavish in their adherence to the source material, and the alterations have provided some interesting surprises along the way. And really, not knowing everything that will happen in a movie is part of its allure, right? Purists will probably disagree, but these Divergent screenplays have been faithful in the areas that count, but have deviated only where needed in order to make a good movie…which, at the end of the day, is what matters most. If the concluding chapter is as good as the first two, this will go down as one of the better trilogies in recent years, and second only to The Hunger Games in the YA dystopian market. Let’s hope the studio bean counters resist the urge to split the last book into two movies as was done with the Harry Potter, Twilight and The Hunger Games series. The penultimate movie in each of those franchises was disappointing and egregiously added filler just to stretch out the story in order to make more money. This brand of cinematic hucksterism, which compromises artistic integrity, subverts authorial intent and fleeces its audience, is downright despicable. The studio executives who conceived and engage in such practices should be tarred and feathered. I say that with as much candor as I can conjure.